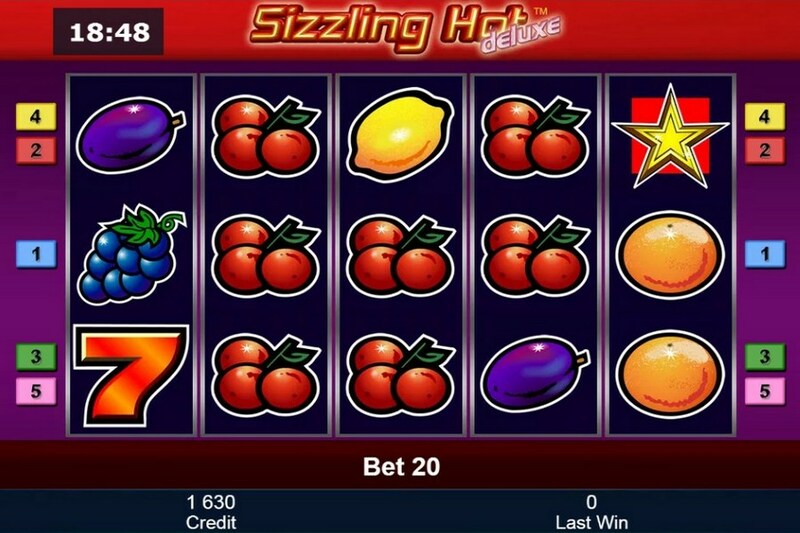 Slot machine game Sizzling Hot Deluxe from casino software developer Novomatic is their own take on nostalgia with an old style classic casino slot. 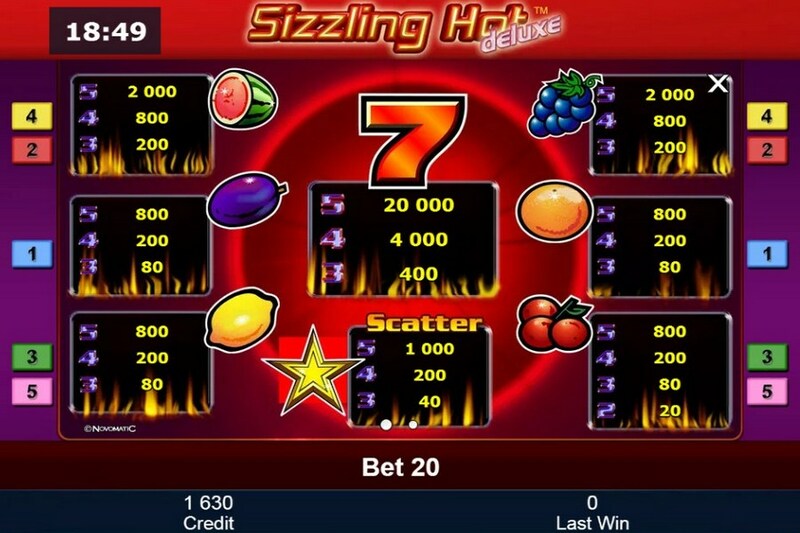 Offering 5 reels and 5 pay lines the symbols used are all fruits and numbers however the speed, sounds and graphics are extremely modern therefore Sizzling Hot Deluxe brings players the best of both worlds. Slot machine game has the wild symbol. It helps you to complete the lines by substituting for any other symbol except the Scatter symbol. 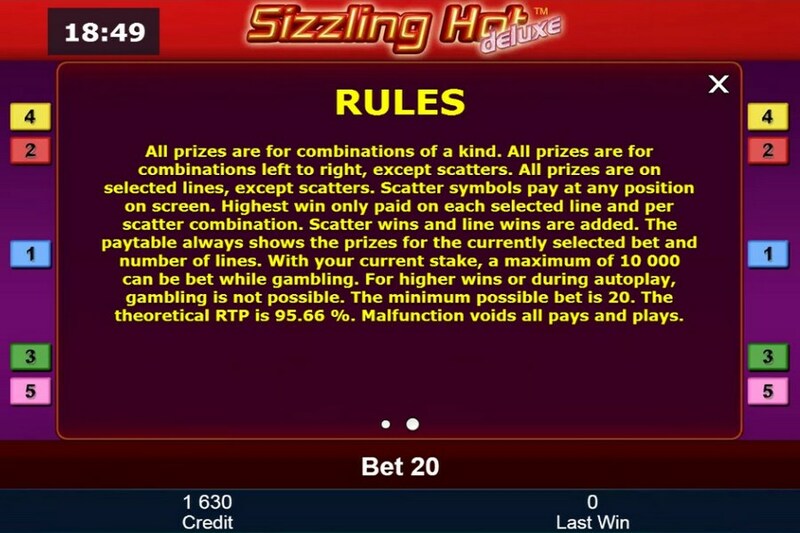 Scatters help you to receive your pays, because they aren’t depend on the place on the reels. And like many of the Novomatic casino slots this one is also equipped with the mini game for those who like to gamble and need to increase the prize. You can use it after any successful spin. Click the gamble button and you will see the deck of shuffling cards instead of the reels. Gamble on the color of the card in the deck. Once you won your winnings will be multiplied. You can take them and continue with the main game or you can gamble on the color of the card again. If you are lucky you can do it up to five times. But if the gambled color mismatched you lose all the won credits for the last spin. Genius lies in simplicity. This video slot proves this phrase. With its simple rules and design it can still be attractive for both the beginners and advanced players. It can bring the big winnings and this is significant! The game symbols are carefully drawn and well animated. The sound scheme is taken from the good old slot machines.